Bite into Beastro - Schaefer Advertising Co. The Zoo can be for grown-ups, too. 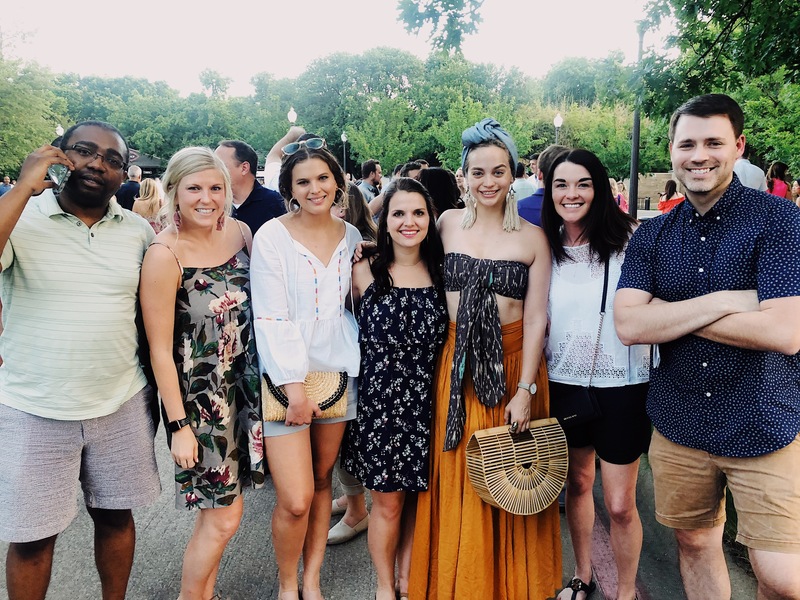 The Fort Worth Zoo has created an atmosphere for a crowd 21- and-older to get excited about good food and good music meeting around their favorite Zoo animals. Beastro, a live music and food event is an annual fundraiser that allows the Zoo to continue advancing their conservation efforts, while giving their visitors a different taste of the Zoo experience – quite literally. The night spans to midnight and features a variety of food vendors with booths, open bars throughout and live music entertainment. 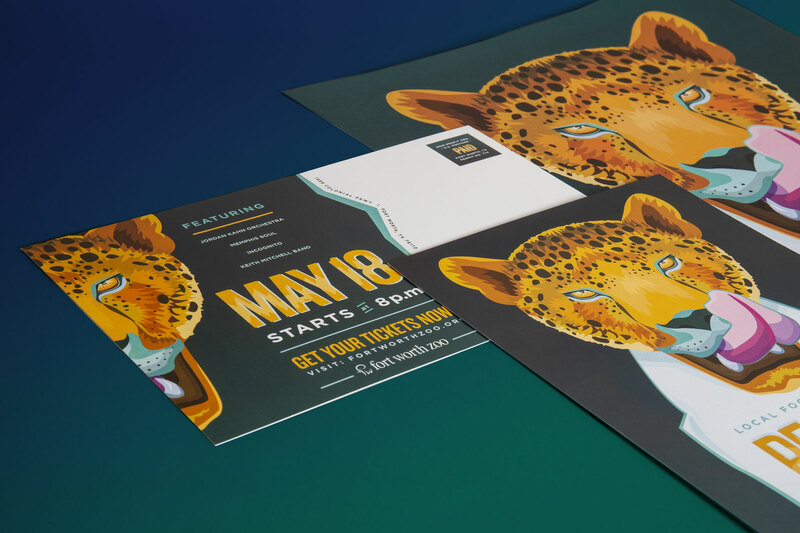 For 2018, the theme across traditional and non-traditional media platforms features a vibrant jaguar hungry for good food, good music and a good cause. 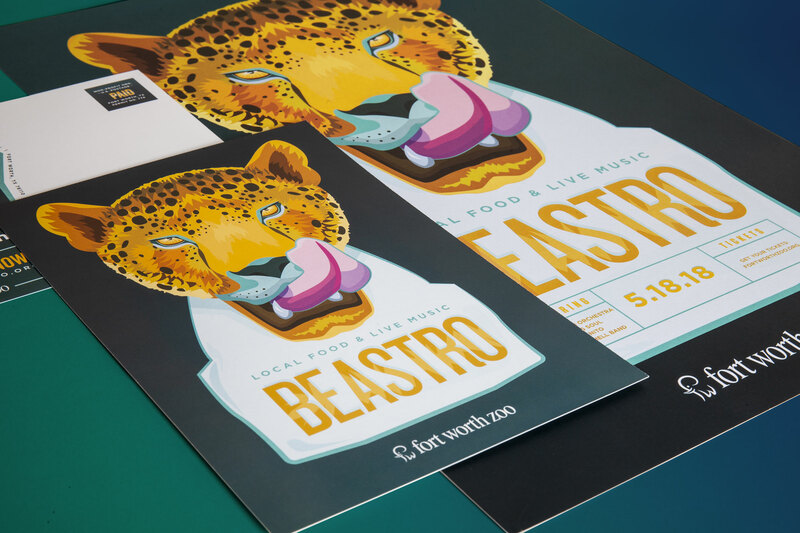 Each year for Beastro, we look to create a festival-like feel tailored toward an audience with eclectic and sophisticated tastes in food and music. The event being a nighttime event, allowed the team to indulge in some color-play, by pairing colors that create a stark contrast and collective vibrancy across all different mediums. The inspiration for the overall design began to lend itself to a late-night neon lights, Vegas vibe. 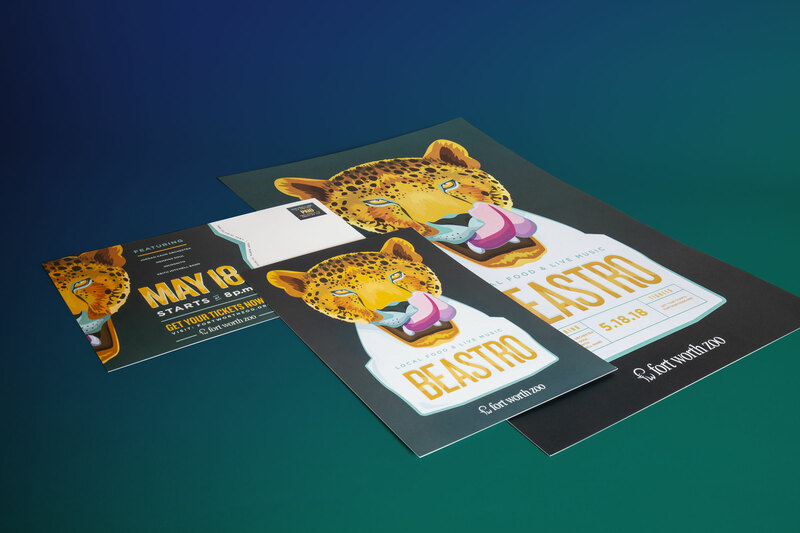 Through the use of a teal gradient, our team created a look that’s reflective of the trendy, vibrant, yet sophisticated event Beastro is. As with anything with the Zoo, animal-selection always creates its own arena for brainstorming. 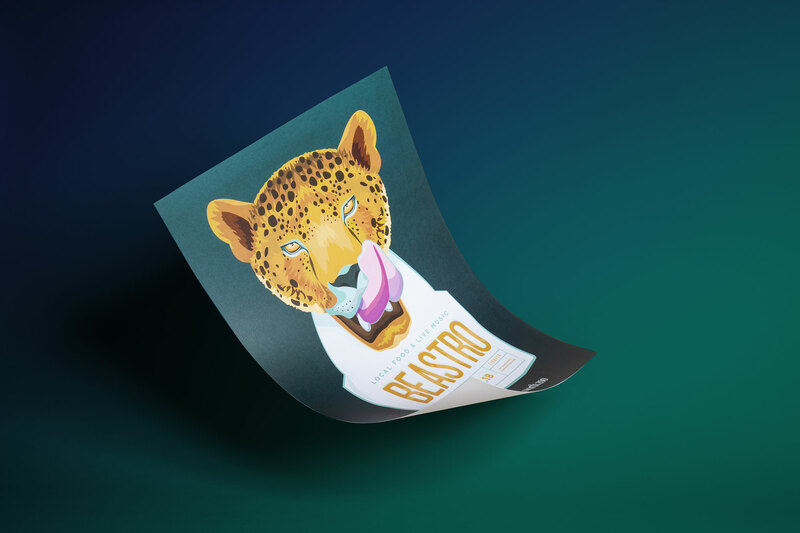 Allowing the jaguar to take shape as the face of the event, there’s an inherent mystery to this animal’s demeanor that ultimately complimented the exploratory environment Beastro creates. With a variety of food vendors and music, there’s opportunity for visitors to come-taste-and-go, learning about new flavors and indulging at every turn of a corner. 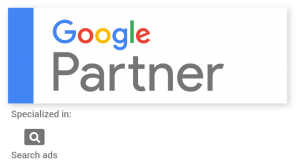 Across different mediums, Beastro carried a presence across many digital mediums including outdoor billboards, webpage takeovers, Spotify ads, email and display banners. It also made its way directly into area homes through direct mail pieces and print ads. This year, weather turned out to be in our favor. The event carries on [light] rain or shine, but the Texas summer has proven to be quickly approaching. More than 40 food vendors set up shop throughout the park before 7 p.m. and more than 1,900 visitors experience the delectable bites, sips and tunes. Weather cooperated and so did the animals. More than 2,200 people indulged in delectable tastes from more than 40 food and beverage vendors, and enjoyed the live music entertainment. 394 people experienced the perks of purchasing VIP Party Animal tickets, and more than 1,800 who purchased general admission tickets lined up this year. This year was a huge success for the Zoo and our team.